I have been using “Chili Powder” a lot in my exploration of Texmex cuisine, but what exactly is chili powder? If you look at the ingredients in the store bought blends you will see things like chili peppers, cumin, paprika, garlic powder, onion powder, oregano, etc. Why is it that many recipes call for both chili powder and cumin if chili powder blends already contain cumin? I decided to explore “Chili Powder” a bit more. There are a lot of different kinds of chili peppers to choose from. I decided to start with some common ones: anchos, chipotles, and guajillos. I went with equal amounts of each pepper. I decided to make a pure chili blend and add the extras (like cumin, oregano, onions and garlic) separately. It turned out pretty good. I will be tossing the store blend in favor of the home made blend. The chipotles add an amazing aroma and the powder is hotter than the store blends that I have been using. In the future I will have to try using different amounts of the chili peppers and using other types of chili peppers. Heat the chilies in a heavy pan until they blister, about 5 minutes. Break or cut the chilies into pieces that are small enough to fill into your grinder. 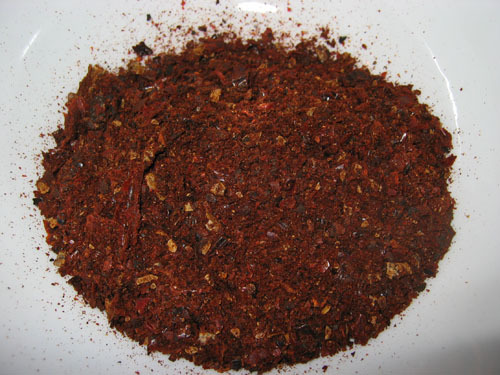 Grind the chili peppers into a powder in your grinder. I usually cook with fresh chilies. But your blend of chili powder would probably have different notes of spiciness.